Steam generator tubes found in commercial nuclear power generating plants and naval vessels are sometimes subject to denting. Left undetected and unchecked, denting in these safety-critical tubing systems can lead to cracking and — ultimately — failure. LTC’s laser-based profiling systems are well-suited for dent measurement in tubes. Using a high-resolution, laser-based profiling sensor, flaw measurement accuracy is typically better than ±0.002 inch (0.050 mm) with resolution to approximately 0.0005 inch (0.013 mm). Using LTC's LaserViewer™ software, operators may interrogate data sets in many ways, including calculating average, minimum and maximum diameter in a local region or over the entire length of the tube. 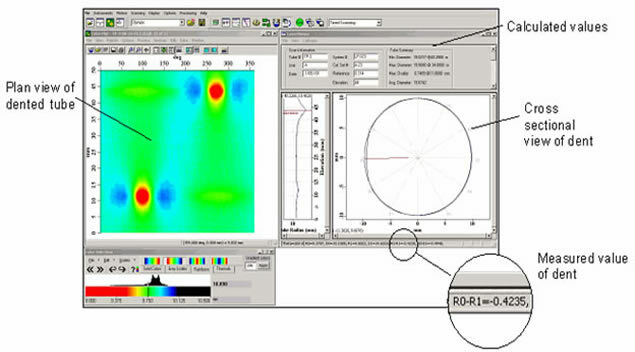 Calibrated data sets may also be exported for further processing using commercial scientific software packages. 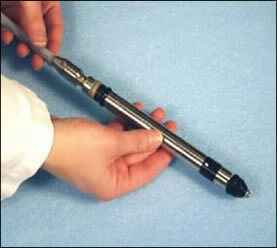 The image below shows a portion of a tube that includes two dents. In the image on the right (cross sectional view) one of the dents is being compared to an undeformed area of the tube near the dent. Its radial magnitude is 0.0167 inch (0.4235 mm).